Tauhinu is a common shrub on coastal farmlands. Its tiny daisy seeds germinate and establish themselves easily on bare soils and in over-grazed pasture. Tauhinu is fast-growing, reaching its maximum height of 2 metres in 10–15 years. 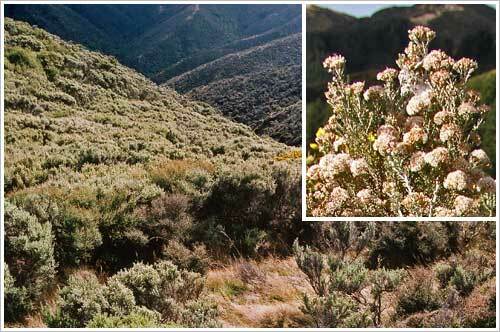 Unless their understorey plants are heavily grazed, tauhinu shrublands are usually overtopped by taller shrubs and trees, and develop into coastal broadleaved scrub.